As a human race, we have always looked to the stars to guide us, and our curious minds have let them take us far beyond where science-fiction writers of the past might even believe. Today, we are creatures who carry around a global collection of information in our purses and pockets. Creatures who can cure disease. Creatures who have stepped foot on other celestial bodies and discovered the existence of thousands of other worlds far beyond the influence of our own. But to propose the concept of a possible multiverse to our ancestors of not so very long ago, would have them see us as crazy. And to show them the abundance of our everyday pillages would have them see us as no less than magical. Science, at its core, is about the observation of patterns, about asking the right questions and about learning from results. The Atomic Tarot features 78 uniquely designed cards that tell a story of a world shaped through the combination magic and science, explored through the eyes of a diverse population that reflects the truth of the world. Mermaids and mathematicians alike are bound to find something relatable in the heart of these cards! This full tarot deck features it's own kind of magic. 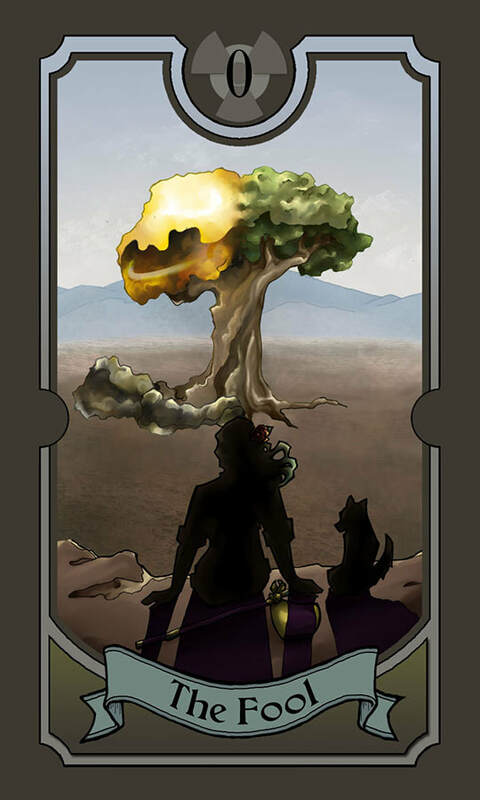 Taking a journey through a post-apocalyptic landscape filled with the fantasy and logic, populated with creatures from both sides of the divide, the Atomic Tarot is a collection of beautiful, surreal, art nouveau inspired illustrations. In addition, the deck comes with a booklet full of information about the process behind the art, and the meanings behind each card, which should be interesting for beginners and advanced readers alike. Whether you need a working deck, or just want a cool little collection of art, the Atomic Tarot is perfect for any collector! But you can still download a copy of the booklet for free, at any time. We are in the process of changing publishers and should have more decks available for order very soon. Make sure you're subscribed to our mailing list to get updates about availability in the future. If you'll notice from a few of the sample cards from our 1st Edition deck (below), we have taken a few liberties with the titles and definitions of some cards. Most of the cards within the Major Arcana retain their traditional names. However, the suits and court of the Minor Arcana have original titles unique to the Atomic Tarot. Starting with the building blocks of the universe and moving into the stars, the four suits of the Minor Arcana consists of ten numbered cards and a court of four faces. The individual suits share common themes, feelings and ideas within themselves.